Shipping and logistics have very specialized needs relative to hydraulics. Harsh marine environments and heavy-use logistics applications require components designed with unique attributes. 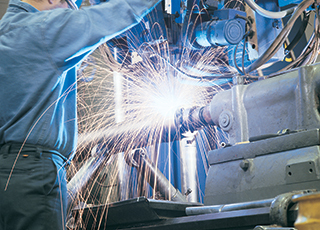 As the industry continues to move greater volumes of goods with larger and more complex machinery, your needs are becoming more demanding and even more specialized. Hader-Seitz works to design custom-built cylinders to meet the needs of our customers. With our engineering and technical expertise, we can work with you on any size project to provide you with the best solutions to your needs. Every custom-designed hydraulic cylinder, piston type accumulator and rotary valve is produce with custom characteristics that contribute to greater efficiencies, higher reliability and ultimately, a high end-user satisfaction. At Hader-Seitz, we work with our customers in any stage of the design process to help achieve the highest quality custom-build products at a great value. No project is too large or too small for us.